YCAT OnCall is demand response transportation service that provides door to door transportation for individuals who, because of a disability, are not able to utilize a regularly scheduled fixed route bus service or access a bus stop. Welcome to Yuma County Area Transit! The Yuma County Intergovernmental Public Transportation Authority (YCIPTA) is proud to provide Yuma County Area Transit (YCAT) fixed route, vanpool and YCAT OnCall demand responsive bus service throughout southwestern Yuma County including the cities of Yuma, San Luis, Somerton, Town of Wellton, Cocopah Indian Reservation and unincorporated communities of Yuma County, including Gadsden, Fortuna Foothills and Ligurta. 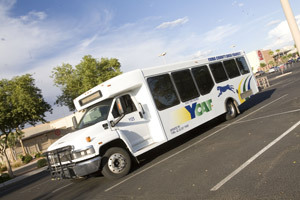 YCAT also provides service into Winterhaven and El Centro, CA and on the Quechan/Fort Yuma Indian Reservation. You can count on YCAT to provide transit services - Monday through Friday 5:30 a.m. and 8:30 p.m. with limited evening service from Arizona Western College, University of Arizona and Northern Arizona University as well as other limited Yuma County and eastern Imperial County destinations in addition to service on Saturday between 9:30 a.m. and 6:30 p.m. Starting, Monday, August 18, 2014 - the Yuma County Area Transit (YCAT) system will get better, faster, more reliable and even more convenient. All routes will provide two way service and timed transfers will occur at Downtown Yuma Transit Center, West Yuma Transfer Hub, Cocopah Casino and AWC/NAU/UA Transfer Hub. We hope you will ride the new YCAT! They say it’s a dry heat but Yuma's summer sun is brutal if you’re not prepared. That’s why YCAT is encouraging riders to stay cool this summer as they plan their transit trips. Here are some cool tips for riders as they walk to bus stops: 1. Always carry water. Containers with spill-proof lids are allowed on buses. 2. Plan your trip. Use YCAT's catTRAX for real-time schedule info to reduce wait times. 3. Create your own shade by using a small umbrella or by wearing a hat. 4. Always wear sunscreen. 5. If temperatures exceed 115 degrees, YCAT will provide free water to all passengers on board buses. Click here for more tips to stay cool and to be safe! We will not have service in observance to President's Day. We will not have service on New Year's Day.